Bombshell: Anthony Watts sez UHI only happens very rarely ... or E-Cat eat your heart out! Anthony Watts has a new article up at WUWT. From what he writes, he now thinks that UHI only happens very rarely. His post is a stark rebuttal to a study of night time heat waves in the north west of the United States. The colors represent different ways of processing the historical readings. University of Washington research shows that the region west of the Cascades saw only three nighttime heat waves between 1901 and 1980, but that number quadrupled to 12 nighttime heat waves in the three decades after 1980, according to a paper published in the July issue of the Journal of Applied Meteorology and Climatology. Nighttime heat waves are when the daily low is in the top 1 percent of the temperatures on record -- in Seattle above around 61.5 F -- for at least three nights in a row. "In general, minimum daily temperatures have been warming faster than maximum temperatures, so we're not surprised to see a trend in the minimum events," said corresponding author Karin Bumbaco, a research scientist at the Joint Institute for the Study of the Atmosphere and Ocean. 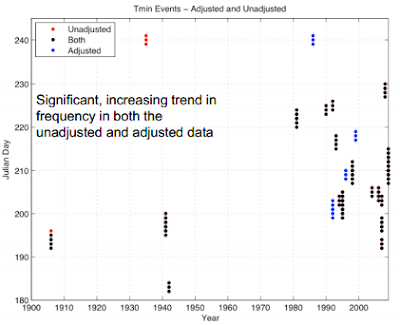 "Still, we were surprised to see this significant increase in the frequency of nighttime heat waves." ...They studied temperature readings west of the Cascade Mountains in Washington and Oregon from 1901 to 2009, looking for instances where the daytime high or nighttime low temperature hit the top 1 percent of readings for at least three consecutive days. The 2009 scorcher set records in daytime temperature, but it was the string of warm nights that stood out, Bumbaco said. By their definition it was a three-day daytime heat wave in the Pacific Northwest -- but included eight consecutive hot nights, the longest seen in the observational record. ...Researchers also found a clue to suggest why we're seeing more hot nights. It's well known that Pacific Northwest heat waves occur when breeze off the ocean is replaced with air flow from the east, which warms up as it flows down the western slope of the Cascade Mountains. But they found another trait for nighttime heat waves. The records show that nighttime heat waves happen during high humidity, where water vapor in the air serves as a blanket to trap heat. E-Cat eat your heart out! What Anthony Watts discovered will amaze and maybe disappoint you. The heat waves weren't caused by high humidity preventing the heat escaping to space. Guess what they were caused by. Yep, you guessed it. They were caused by UHI at the Seattle Tacoma Airport, which miraculously heated up at night time for at least three nights in a row on no less than twelve occasions in the years since 1980. And the effect was so huge on those twelve occasions that it heated up the night time air of entire north-west of the USA, west of the Cascades. July 22, 2013 at 2:09 pm I did not read anything about how Jet powered aircraft traffic has also increased at day and night or how Commercial Jet travel was not around before the 1970′s Prop powered aircraft put off way less heat. Jet engines are Giant blower heaters so having a temp gauge reading station anywhere near a runway will NEVER be accurate. July 22, 2013 at 2:13 pm Please consider SeaTac opened a 3rd runway in 2008, arguably increasing the paved area surrounding the GHCN station by more than 50%. July 22, 2013 at 3:26 pm Sounds like this is clearly linked to UHI effects for land based temperatures. July 22, 2013 at 4:28 pm (blah blah blah) UHI looks the likeliest reason. July 22, 2013 at 4:55 pm UHI, including the effect of reduced urban aerosols, looks the likeliest reason. The next time you have a few hot nights, don't go out and buy an air conditioner. Write to your Senator and the Mayor and the local school teacher and whoever else you can think of and get them to shut down Seattle airport. That's wots causing all them night time heat waves! Ain't blog science just great. Bumbaco, Karin A., Kathie D. Dello, Nicholas A. Bond, 2013: History of Pacific Northwest Heat Waves: Synoptic Pattern and Trends*. J. Appl. Meteor. Climatol., 52, 1618–1631. There is, again, so much wrong with this WUWT post. AW: "Asphalt, concrete, bricks and other infrastructure holds the energy from daytime solar insolation and releases it at night as LWIR. Anyone who has ever stood next to a sun illuminated brick wall after sunset can understand this." And someone who sells weather stations for a living should know that the thermometer of a weather station is protected by a screen against infrared radiation ("LWIR") (and solar insolation). Furthermore, the study did not only use that one airport station, but 39 stations in total. But I guess that even after blogging about climate for so many years and writing poor posts 5 times a day, Watts interest in climate is not sufficient to read about the basics in the IPCC report. Trenberth, K.E., et al., 2007: Observations: Surface and Atmospheric Climate Change. In: Climate Change 2007: The Physical Science Basis. Cambridge University Press, Cambridge, United Kingdom and New York, NY, USA.